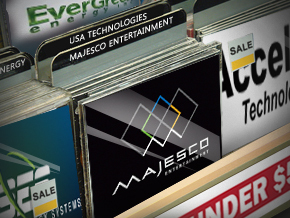 Majesco Entertainment and Evergreen Energy, among other cheap stocks, have more than tripled so far in 2011. BOSTON (TheStreet) -- Stocks under $5, such as Evergreen Energy (EEE and Majesco Entertainment (COOL, have more than tripled this year, leapfrogging the broader market and surprising investors who haven't heard of these penny-stock companies. Money managers are arguing that investors should move into less-risky asset classes like large-cap equities after the rapid appreciation small-cap stocks have enjoyed during the two-year bull market. But small-cap stocks continue to perform as well or better than broader market averages. The Russell 2000 index -- a benchmark for small-cap stock performance -- is up 7.5% so far in 2011, matching the performance of the Dow Jones Industrial Average and outpacing both the S&P 500 and Nasdaq Composite. Analysts expect stocks under $5, like Sprint Nextel ( S and SatCon Technology ( SATC, to outperform this year, but those companies haven't been among the biggest winners. Penny stocks including Evergreen Energy have surged as much as 300% over the first four months of the year. Investors in penny stocks must be prepared to lose it all. The risk of a sharp, quick selloff is elevated for investors in these companies. For example, LECG Corp. ( XPRT, which as a service offers independent expert testimony, dropped 93% this year to 9 cents and lost its listing on the Nasdaq. Meanwhile, Integra Bank ( IBNK has tumbled 78% in the quarter to 17 cents, and Chinese cloud-computing company Subaye ( SBAY is down 78% to $2.15. Still, many inexpensive stocks have generated huge returns for lucky stock pickers. The following pages detail the best-performing stocks under $5 this year on the New York Stock Exchange, Nasdaq and NYSE Amex, ranked by total return for the quarter. Company Profile: Radio One is a multimedia company that mainly targets African-American consumers. The company owns 53 broadcast stations located in 16 urban markets in the U.S.
Shares of Radio One, which traded below $2 at the end of March, jumped in early April after the company closed on a new senior secured credit facility comprised of a $25 million revolving credit facility and a $386 million term loan. On April 18, Radio One announced a $15 million stock repurchase and said that preliminary results show that revenue in the first quarter rose 10.9% from the same period a year earlier. Analyst Ratings: Gilford Securities has a "buy" rating and $2.75 price target on Radio One, while EVA Dimensions maintains a "hold" rating on the stock. TheStreet Ratings has a "sell" rating on the stock, which it has maintained for two years. The latest report highlights Radio One's "unimpressive growth in net income, weak operating cash flow, generally disappointing historical performance in the stock itself and generally weak debt management." Company Profile: Central Federal is the holding company for CFBank, an Ohio-based community-oriented financial institution offering financial services. Shares rallied in January after Central Federal said it had regained compliance with the Nasdaq's minimum bid price requirement. The stock was subject to delisting if it didn't close above $1 a share for a period of time. In February, Eloise Mackus, who had been serving as the company's interim CEO since May 2010, was officially appointed to the top executive position. Analyst Ratings: Central Federal isn't followed by research analysts. However, TheStreet Ratings has a "sell" recommendation on Central Federal, noting "disappointing return on equity and generally disappointing historical performance in the stock itself." Company Profile: Capital Trust is a finance- and investment-management company that specializes in credit-sensitive structured financial products. The company is focused on the commercial real estate industry. The stock spiked in April after Capital Trust announced a debt restructuring deal, which was financed by a new $83 million mezzanine loan provided by an affiliate of Five Mile Capital Partners. Analyst Ratings: There are no analysts following Capital Trust. TheStreet Ratings has a "sell" rating on the stock, which it has maintained for two years. The latest report highlights Capital Trust's "feeble growth in its earnings per share, deteriorating net income and weak operating cash flow." Company Profile: Authentidate provides software applications and Web-based services for businesses. The surge in Authentidate's stock started in early April after the company completed the sale of its wholly owned subsidiary, Authentidate International AG, to Switzerland's Exceet Group AG. The transaction yielded net cash proceeds of $1.3 million. During the second half of April, the Department of Veteran Affairs, Ameri-Quipt and Superior Oxygen & Medical Equipment selected Authentidate's services. Analyst Ratings: C.K. Cooper & Co. is the lone firm with research coverage on Authentidate, rating the stock a "buy" with a $2 price target. TheStreet Ratings has a "sell" rating on the stock, which it has maintained for two years. The latest report on Authentidate highlights the company's "deteriorating net income, disappointing return on equity and feeble growth in its earnings per share." Company Profile: USA Technologies is a supplier of cashless, remote management, reporting and energy-management services. Shares of USA Technologies ramped higher in January after the company said revenue in its fiscal second quarter jumped 60% from a year earlier to $6 million, while its net loss narrowed to a penny a share from a loss of 19 cents. Shares pulled back slightly in March after USA Technologies announced it raised nearly $11 million in a private placement of common stock. In April, USA Technologies announced a collaboration with Verizon Wireless for connectivity that enables wireless point-of-sale payments at vending machines via credit and debit cards. Analyst Ratings: Janney Montgomery Scott is the only research firm with coverage of USA Technologies, rating the stock a "hold" with a price target of $1.25. TheStreet Ratings has a "sell" recommendation on USA Technologies, citing disappointing return on equity. Company Profile: Dynatronics makes medicine and aesthetic products used by physical therapists, chiropractors, sports-medicine practitioners, podiatrists and physicians. In March, Dynatronics announced that it signed a contract with FirstChoice Cooperative, the third group purchasing organization contract the company signed in two months. In April, the company regained compliance with the Nasdaq's listing requirements, as the stock climbed above $1 a share to satisfy the minimum bid price requirement. Analyst Ratings: No research firm follows Dynatronics. TheStreet Ratings has a "hold" rating on the stock after upgrading from "sell" on Sept. 30, 2009. The latest report says the company's largely solid financial position, reasonable debt levels and expanding profit margins are countered by deteriorating net income, disappointing return on equity and weak operating cash flow. Company Profile: Synthesis Energy builds plants that use proprietary gasification technology to convert low-rank coal and related wastes into higher-value energy products. Shares rallied in March after Synthesis Energy signed an agreement with China Energy Industry Holding Group for a cash investment of $83.8 million to support Synthesis Energy's business strategy in China, including project development and investment. Analyst Ratings: Two research shops follow Synthesis, with Deutsche Bank rating the stock a "buy" with a $3 price target. The other firm, Johnson Rice & Co., rates the stock as "equalweight." TheStreet Ratings has a "sell" rating on the stock, which it has maintained for two years. The latest report cites several negative areas for Synthesis, most notably the company's poor profit margins. Company Profile: Acceler8 Technology develops materials and instrumentation for applications in medical instrumentation, basic research, drug discovery and bio-detection. The stock surged in the absence of any headlines in January, prompting an inquiry from the NYSE for the unusual volume activity. Acceler8 shares again spiked in February after the company said an evaluation agreement with Novartis ( NVS was extended to June 30. Novartis will pay the company a monthly fee for an exclusive-rights extension. Analyst Ratings: No Wall Street firm covers Acceler8 Technology. TheStreet Ratings has a "hold" rating on Acceler8's stock, arguing that the company's "robust revenue growth, largely solid financial position with reasonable debt levels by most measures and notable return on equity" are counterbalanced by the company's limp profit margins. Company Profile: Evergreen Energy is a so-called cleaner coal company. On Jan. 5, Evergreen was granted an extension by the NYSE Arca to regain compliance with listing rules regarding minimum bid price and market value of publicly traded shares. By March 3, Evergreen regained compliance with the listing standards. The stock hit a 52-week high shortly after the company completed a $16 million private placement of common stock. Shares pulled back, though, after Evergreen posted financial results for 2010. Revenue for the year fell to $403,000 from $423,000 in 2009. Analyst Ratings: No research firm has coverage of Evergreen Energy. In addition, TheStreet Ratings doesn't follow the stock. Company Profile: Majesco Entertainment makes video games mainly for the family-oriented, mass-market consumer. Majesco's incredible run this year started on Jan. 11 when the company announced it had shipped more than 500,000 copies of its Zumba Fitness video game title for the Wii, Xbox 360 and PlayStation 3. In late January, the company announced that it regained compliance with the Nasdaq's minimum bid price requirement for continued listing. In early March, shares of Majesco climbed higher after the company posted better-than-expected fiscal first-quarter financial results, with revenue jumping to $48.5 million from $29.2 million in the same period a year earlier. Analyst Ratings: Majesco garners a lone "buy" rating from Needham & Co. and a "neutral" rating from Wedbush. Interestingly, Needham analysts have a $2.50 price target on the stock while Wedbush has a $2.80 target. TheStreet Ratings has a "hold" recommendation on Majesco Entertainment. The research report says revenue growth, a largely solid financial position with reasonable debt levels and solid stock price performance are strengths that are countered by the company's weak cash flow from its operations. >>To see these stocks in action, visit the 10 Best-Performing Stocks Under $5 portfolio on Stockpickr.